And this cover is the most normal aspect of the game. Ah, the rhythm game. Nowadays, everyone knows the “Modern Music Genre” games like Guitar Hero or Rock Band. But there is a certain sense of sadness that washes over me when I remember the pre-Guitar Hero days. The sense of experimentation and new-ness that permeated the then-small genre is all but gone now, replaced by big plastic instruments and woefully similar sounds. This is, of course, not to say that I don’t like them. I have had many a good time playing Guitar Hero (it’s almost a tradition to go a few rounds with my friends in III every year on my birthday), but consider the trailblazers of yesteryear: Parappa the Rapper, Space Channel 5, Samba De Amigo. So much creativity in every one of them, be it through strange play styles or just plain odd music choices. Today, we are going to talk about one that has both: a strange and challenging gameplay style and a selection of songs that must be heard to be believed. 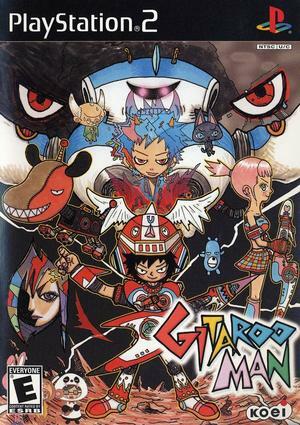 I am talking about the early 2000s cult classic, Gitaroo Man. This entry was posted in Review and tagged Acid, Catchy, Colors, Gitaroo, Mojo, ps2, Rhythm Game, Ridiculous, U-1 on April 17, 2011 by Hachi76.